I recently wrote a well-received piece about the political positions of the Intellectual Dark Web (IDW), and a ferocious discussion erupted in the comments regarding Dave Rubin‘s political philosophy. To a modern liberal, Libertarian basically means someone who cares only about themselves. Rubin calls himself a Classical Liberal, but it turns out that people on Twitter and Reddit aren’t sure exactly what that means. Rubin himself says he’s undergone a Conservative Transformation lately, leading many liberals to claim he’s simply become a Libertarian. Meanwhile, Libertarians are saying those are completely different things. 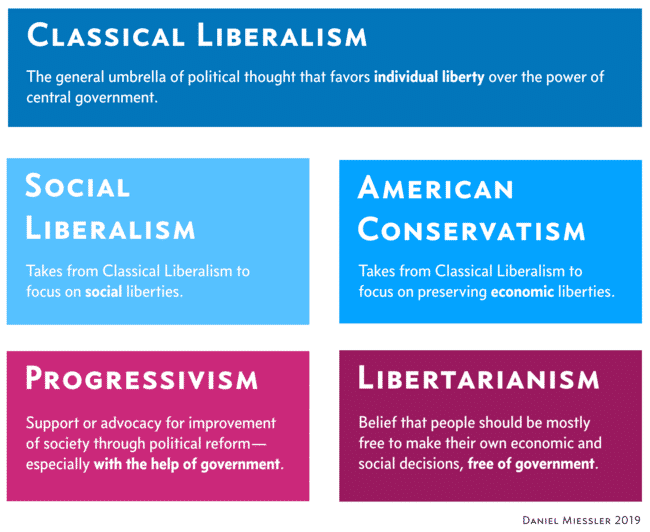 A cursory look at the definitions of Classical Liberalism and Libertarianism had them looking nearly identical. So I decided to do a deep dive on the differences. Here’s what I found, combined with my analysis of the situation. Classical Liberalism was a strong counter to previous political movements that placed authority in the hands of churches, monarchs, or governments. Its central theme was the freedom of individuals rather than central authorities, and the idea was spawned by a number of original thinkers like Adam Smith, John Locke, and others as a response to the industrial revolution and population growth in the late 1800s. Social Liberalism and Conservatism emerged from Classical Liberalism in the early 20th century. Classical liberalism is the philosophy of political liberty from the perspective of a vast history of thought. Libertarianism is the philosophy of liberty from the perspective of its modern revival from the late sixties-early seventies on. Social Liberalism focused on having the government still manage much of the economy, but with more social freedoms. Conservatism focused on the government still upholding traditional social norms, but allowing economic freedoms—especially regarding the use of free markets. Libertarianism is a strong form of Classical Liberalism that argues that individuals should be left alone—without much influence from central government, and that personal responsibility is the most powerful ingredient of success. Pure Libertarians believe the government should stay out of both social and economic issues, meaning they tend to offend both Social Liberals and Conservatives, for opposite reasons. 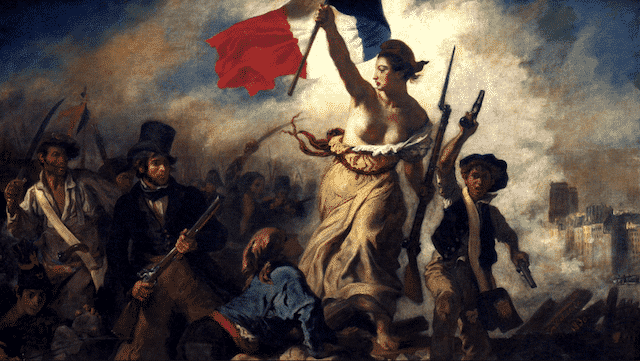 Classical Liberalism was originally a break away from churches, monarchies, and powerful and prescriptive governments—with a counter-focus on freedom of the individual. The difference between Classical Liberalism and Libertarianism is that Classical Libertarianism was a backlash against theocratic monarchies and oppressive governments, whereas modern Libertarianism is more of a response to a bloated and overreaching government and welfare state. The difference between Classical Liberalism and modern Liberalism is that Classical Liberalism wanted to reduce government involvement and focus on individual freedoms, while modern Liberalism is aggressive Progressivism that advocates for the use of the government to accelerate progress towards fairness and equality. Over the last week or so I watched a ton of Dave Rubin videos, and what I found will likely upset readers both on the left and the right. First, I don’t think Rubin is being academically or politically accurate in branding himself as a Classical Liberal. And from what I’ve seen, he isn’t actually claiming this. Dave is a bit confused right now, but you probably would be too if you were gay, Jewish, previously liberal, and were currently going through a conservative awakening. He’s not a Conservative in the common use of the word, and he doesn’t want to use the term Libertarian because it has negative connotations. So I think he’s reached back into history for a loftier-sounding synonym that doesn’t make him feel as uncomfortable. I make an argument here that the IDW is basically a collection of upset liberals looking for honest conversation. That’s the part that will upset readers on the right. The part that will upset readers on the left is that I’ve yet to find evidence of actual hatred or malice in his videos. Yes, he gives props to Trump—who I cannot stand—and yes, he’s all over the place on healthcare and climate change. But to me he is behaving exactly like a liberal with a severe case of PTSD—not like an evil or hateful person. I see him as good-natured and wrong, which is much different than someone like Rush Limbaugh or Trump. Rubin is using “Classical Liberalism” because it gives liberals a tiny moment of confusion before they attack, but it’s really just new packaging for his individual—and very fluid—brand of Libertarianism. In short, “Classical Liberalism” is being used by some on the right today as a somewhat pseudo-intellectual way of claiming that their unwillingness to use taxation and government programs to help the ailing and unfortunate masses is somehow a superior policy because 1), the phrase is old, and 2) because the “liber” in Classical Liberalism (insert Kung-fu here) means freedom. So it’s not that they’re selfish or uncaring—it’s just that they value freedom from government more than they value helping people they don’t know (and who should be helping themselves anyway). But don’t call them Libertarians. They’re Classical Liberals. Classical Liberalism and Libertarianism came from different times, and had different catalysts. The former was removing the oppression of theocracies, monarchies, and the very notion of it being permissible for a small group to rule over the masses, while the latter is addressing the overreaches of imperialism, bureaucracy, and progressivism. But both are movements to reduce the influence of central authorities over individuals. So, yes…in the past there was a difference in Rubin’s Classical Liberalism and today’s Libertarianism, but in 2019 and 2020—in this political climate—the distinction is negligible. I created the diagram myself using my own hybrid paraphrasings of multiple definitions across multiple sources. Because meanings change so quickly, and because we’re in the midst of such a quick change right now, I felt I needed to take that (ahem) liberty. When I tried to use more formal definitions they lacked clarity, concision, and/or context. If you’re a Political Science expert (I’m not) and I’ve offended your profession, please tell me how I can tweak them to be more accurate. For the record, I know many good-hearted Libertarians and Conservatives. Just because I think this particular strain of wordsmithing is bankrupt doesn’t mean I think there’s no merit to any of these anti-government arguments. Don’t start with the anti-progressive/modern liberal stuff here. That’s a separate argument to be had in a separate thread. This one is just about the definition of Classical Liberalism.